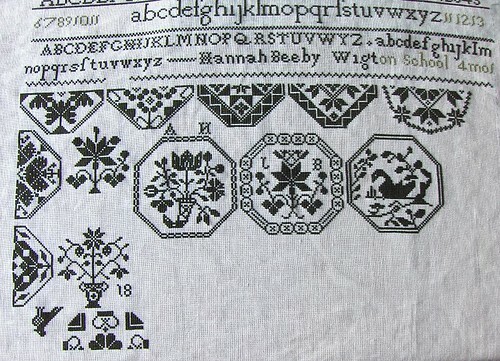 Want to share some more progress on Hannah Beeby - had less time to work on this sampler, as I've been making a dent in clearing and cleaning out the attic, box by box. Priority being my stash and making sure that nothing gets tossed out "by accident"! Bags and boxes of wool fleece, yarns, old fabrics, crafty "things" and gadgets, etc. Some of you may have done this and know what a task it is! Next are books, magazines, CD's, vidoes, clothes and coats....pffft! It probably looks much worse than it seems, and one always seems to create more mess while going through the process, but I just keep telling myself, it's all for a good cause: having a really nice attic to relax in, lounge, host friends and guests. The three large hexagons are now done! My only grumble about this pattern is that it's broken up into sections, and it's a bit of a fiddle to make sure you continue properly from one page to the next. I managed upon advice from a friend to tape some together, but not all of the pages line up ( I made copies for myself - I didn't tear up the pattern book) making it tricky to follow. Other than that, it's basically smooth sailing. Since the beginning of this year I haven't touched anything quilty - just focused on Hannah, but tomorrow that will change. Together with some friends, old and new, we'll be spending the day together, visiting quilt shops, lunching and quilting at my house. I've made a new year's resolution that finishing existing projects would be the priority, leaving myself only one gift quilt to make (promised months ago), and one new quilt project for which I'll be picking up the fabrics for tomorrow. So there you have it! I'm heading back up into the attic, and wish you all very good and creative weekend! Hannah is gorgeous! Enjoy your quilting day. Shopping for fabric and topping that off with a great lunch sounds wonderful. Have fun and take care. that is gorgeous cross stitch - very inspiring!